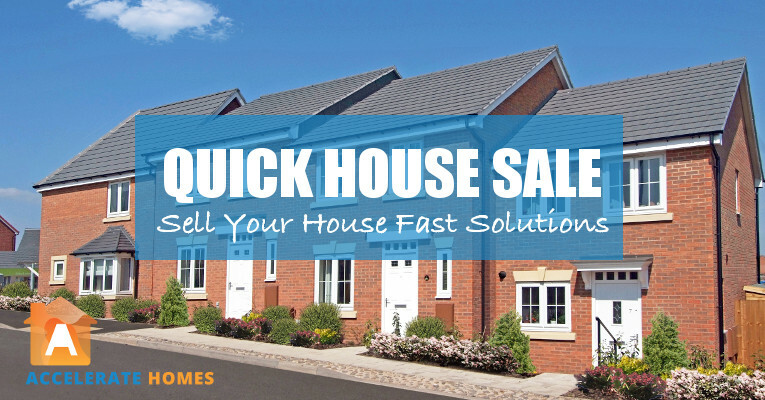 Are you looking for a quick house sale? If so you have come to the right place. Accelerate Homes connect homeowners with the UK’s leading cash property buyers. All our partners specialise in quick house sales and will buy any house in any condition, nationwide. Our recommended partners have access to significant cash funds, which means they can buy your property today for CASH! Unlike some “cash buyers”, our select group of buyers do not rely on third party lenders or investors. All deals are structured using our network’s cash investment fund. In short, this means that with us there is no waiting around to secure financing, no chains, no viewings, no need to make your house sale-ready. We know that selling your property fast can seem like a daunting prospect, but at Accelerate Homes we take all the stress out of the process. Our service is straightforward, transparent, and you guessed it, super quick! In this short article we explain how our quick house sale solutions work and show you how you can sell your property quickly, today! Don’t have time to read on? Get a free, no obligation estimate for your house by completing the form here. If you don’t have a private sale option on the table, then there are three ways to sell your house quickly. Below we discuss each briefly. As you are trying to sell your house quickly we assume that you have already considered or tried using an estate agent. Estate agents are generally a good solution when you have lots of time or are in a fast moving property market, but if time is not on your side then using an estate agent will almost certainly slow the process up for a quick house sale. Moreover, with an estate agent you are often subject to tedious viewings and complex chains. Not to mention estate agent fees and legal costs! Using a specialist property auctioneer is another potential quick house sale solution, but again auctioneer fees are high, sales aren’t guaranteed and worse still you might get an offer well below your expectations! Click here to read about selling property at auction. Selling to a cash buyer is a great solution if time, cost and ease of transaction are important. That being said though, not all cash buyers are made equal. There are some players in the market who cut corners, have unethical practices and dubious track records. We recommend reading our article on how to avoid quick house sale scams. Other good resources to consult before engaging a quick house sale company are the National Association of Property Buyers and The Property Ombudsman. Accelerate Homes partner with a select group of respected cash buyers who are members of both organisations and operate to a strict code of conduct. Quick House Sale – Cash Buyer vs. Estate Agent! To help you assess whether a cash property buyer is the right option for you we have set out a worked example. This quick house sale comparison to a traditional estate agent route is for illustrative purposes only and values may differ depending on your personal circumstances. 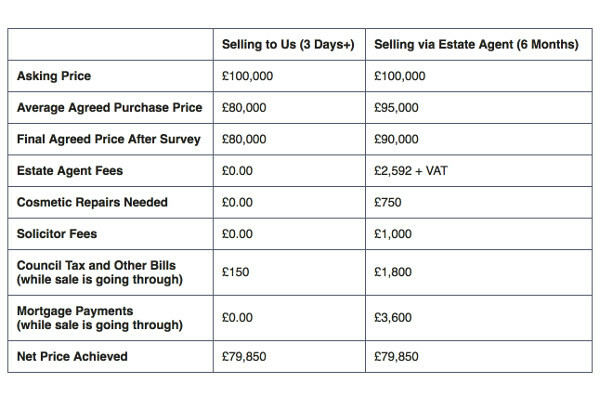 As you can see in the chart a seller with an asking price of £100,000 will typically receive an offer from a cash property buyer at about 20% below market value (subject to a RICS report). This may seem like a significant discounted value, but when working with a a good cash buyer, like the ones we recommend, you will not need to pay any fees. The cost of a survey and legal fees will be covered. This means the offer price received is often very close to the net price after completion. With an estate agent the scenarios can vary, but generally the agreed sale price after a survey is around 5-10% below one’s asking price. However, this is the point at which costs start creeping in. There will be a 1-2% estate agent fee to consider, a solicitor’s fee, and often the largest cost will be the mortgage repayments during the months that it can take to sell and complete on a traditional estate agent sale. As you can see the net price received is often very close to the final value one would receive should one work with a cash property buyer. Over and above the financials though there are some significant benefits of working with a cash buyer. Complete in as little as 7 days. Most of our partners can complete a quick house sale within 28 days, but it you need to go faster they can! No contract tie ins and there is no obligation to proceed. All our recommended partners offer service that is fair, transparent and risk-free. The best part of working with Accelerate Homes to achieve a quick house sale is the simplicity of the process. There are three basic steps. Using the enquiry form above send us your details. Will will connect you with one our our cash buyers, whose valuation team will contact you within 24 hours to discuss their initial offer and your selling needs. If you are happy with the details the buyer will instruct an independent RICS (Royal Institute of Chartered Surveyors) survey to visit your property and produce a valuation report. Based on the outcome of the report they might adjust their initial offer upwards or downwards. They will send you their final offer for your consideration. If you are happy with the final offer the buyer will agree a completion date that works for you and their team will take care of all paperwork. Most of our partners can instruct a solicitor for you or you are welcome to use your own solicitor. All our partners will cover your costs so you can focus on your next move. To get a quote for your quick house sale click here.